Note from Carol - I recently connected to a mom from a nearby community who also lost her daughter to suicide. The common link of our journey is a horrible one but together, we are able to talk and share. This past April of 2018, her daughter Melaina, at the young age of 16 , died by suicide. Over a few breakfasts , Melaina's mom and I have shared many tears of sadness as well as laughter from sharing stories about our daughters. Our girls were very similar in their likes and even dislikes. Sitting for hours at a time just talking to Melaina's mother brought me back to wondering what and how I must have been thinking and feeling in the first months, and then each month after that. Shock, sadness, anger, grief. Yes, the emotions were heavy and I think I locked them away as a way to cope, only to have them surface and wonder. I shared with Melaina's mom that there would be an upcoming online auction hosted by Amanda's Legacy. Her mom shared with me that she wanted to start an Arts Scholarship in her daughter's name. It is with this in mind that there will be items on the Legacy Online Auction - #Positivity2018 that will go directly in supporting the Melaina Paisley Arts Scholarship Fund. ​The Melaina Paisley Arts Scholarship has been provided an opportunity to participate in an online auction hosted by the Amanda Todd Legacy Society. The auction will coincide with World Mental Health Day on October 10th. This year’s theme is "Young people and mental health in a changing world". Funds generated through contributions made in Melaina’s name will go towards the Melaina Paisley Arts Scholarship program. Melaina’s Arts Scholarship was formed following her death by suicide in April 2018. Melaina struggled with anxiety but often found comfort in dance, gymnastics and circus. Melaina was a kind and compassionate friend, a loving caregiver to animals and a very graceful artist. 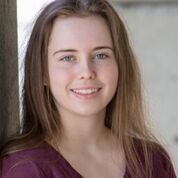 This Scholarship provides a means to celebrate Melaina’s enthusiasm for the performing arts by assisting students with similar passions and interests. By supporting these young artists, we provide healthy mental health experiences that include creative expression, a foundation for healthy living, as well as opportunities to develop positive friendships and a sense of belonging. It is hoped this award will continue to be provided annually.